How Do I Pick the Best Weight-Loss Diet? How does food fit into my day? Are you a parent who prepares all the meals? Consider diets that aren’t disruptive to your routine. Too many restrictions will sabotage your best intentions. Adapt a diet that won’t have you doing double duty at mealtime. Are you a single, active professional? Access and time to exercise at gyms, studios, and nearby parks will be a boon to any diet you choose. Sustain your energy levels by choosing a diet that isn’t too low in calories or fat. Do you travel extensively for work? Think ahead to what you can realistically eat on the road. Narrow food choices or nutrient-balancing diets will make eating out an arduous task. Incorporate exercise routines into your daily plans whether it’s booking a hotel with a gym or packing running shoes for each trip. How do I best like to eat? Are you highly organized and detail-oriented? You might lean toward nutrient-balancing (The Zone) or low-fat diets that give you precise guidelines to follow. Do you work best with outside motivation? Support group weight-loss programs, such as Weight Watchers, work for many people who succeed when fellow dieters are there to cheer and reinforce their diet goals. Are you an avid snacker or a three-meals–a-day person? Diets with prepackaged foods parse meals out in neat, calorie-counted packets; this might work for people who feel their snacking calories add up to too much. Three-squares-a-day people might find that nutrient-balancing diets or low-carb, high-protein diets sustain them between meals. Are you a vegetarian? High-protein diets that emphasize meat and dairy rule out the vegetarian crowd, while low-fat, high-fiber diets more closely approximate an herbivore’s eating patterns. How can I get in enough exercise? Do you like to work out alone? Try running, cycling, or swimming. Do you need the motivation of a gym? Take up weight-lifting, exercise classes, or hire a personal trainer. Do you like the camaraderie of team sports? Join a rowing, soccer, or other team. Do you crave adventure? Take up kayaking, rock climbing, or other outdoor fun. Regardless of which diet you choose, aim to lose weight slowly, 1/2 to 2 pounds (0.25 to 0.9 kg) per week. Eat smaller portions and take in fewer calories than you expend. Don’t skip meals in an effort to cut calories. 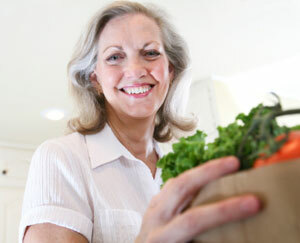 Make eating moderately and sensibly your lifelong diet! Kathleen Finn is a freelance writer and marketing consultant in the natural health industry. The thought of a low-carbohydrate diet sends her directly to the bread and cracker aisle.